Since the holiday season nearly upon us, it becomes time to begin planning your company’s annual party – either hosting or attending. A party offers a great opportunity for everyone to blow off a little steam, while improving employee morale as a result. The organization’s corporate culture also gets a boost from hosting a fun and memorable event. 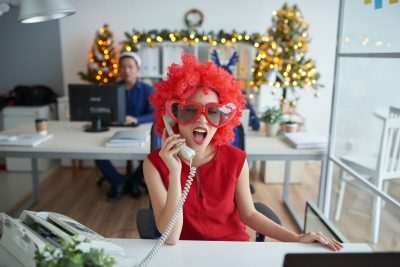 With an eye towards the best holiday party possible, check out this somewhat humorous list of a few “dos” and “don’ts.” Consider this to be an early gift of good advice. Expect this year’s shindig to still be talked about years in the future! While a triple helping of eggnog may go down easy, its aftereffects last a lot longer. Always remember that the company holiday party is a professional event. So don’t let too much good cheer be the cause of lasting damage to your reputation. If the company’s holiday party is scheduled for the evening or weekend, don’t ignore the invitation. Sure, it’s easier to attend a party during office hours. However, your managers may notice your absence if you choose to pass on an evening party. Cultivating a reputation as a good “team player” is a must. This includes attending company social events outside of normal office hours. Simply treat it like an opportunity for fun. Remember your organization likely employs a diverse workforce that celebrates different holidays at this time of the year. So be sure the company party stays largely non-denominational. As such, keep the Merry Christmas signage to a minimum. If need be, just make sure all holidays are referenced in the party decorations; within reason of course, unless your company boasts more than a few members of the Church of the Flying Spaghetti Monster. Considering the company holiday party likely includes a free bar, providing some form of ride service for impaired drivers is smart. Providing a karaoke machine in this environment, however, isn’t a wise choice. An employee willing to serve as a designated driver, a local cab company, or even a rideshare service like Uber all suffice. The important thing is ensuring everyone gets home safely. When you need additional advice on building a great career or a talented staff in the IT world, talk to the team at The CERES Group. As one of the top technical staffing agencies in New England, we are your partner in success. Explore these open IT positions and apply today!